The City of Newburgh Human Rights Commission hosted the Second Annual Black Pioneers of Newburgh at the Newburgh Free Library on Saturday, February 18, 2017. 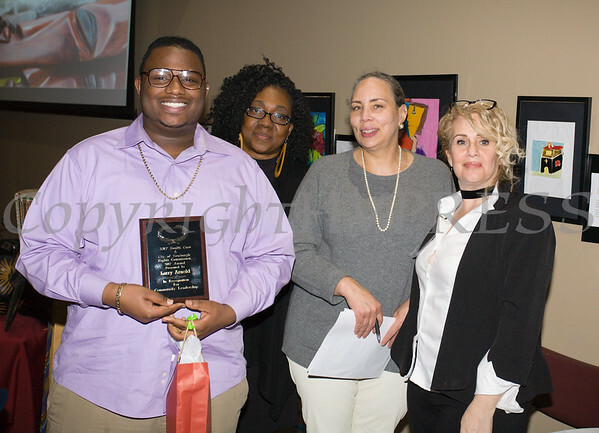 Larry Arnold receives his award from Malinda Ware, Ramona Burton and Rosina Tezgeldi during the City of Newburgh Human Rights Commission sponsored Second Annual Black Pioneers of Newburgh at the Newburgh Free Library on Saturday, February 18, 2017. Hudson Valley Press/CHUCK STEWART, JR.